Disclosure: I will be given tickets to the game in exchange for this post and my review of the event. If you ever saw them as a child, the current team doesn't disappoint. 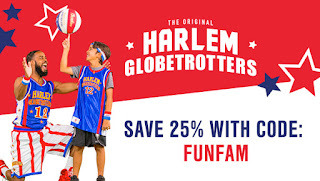 With a star-studded roster featuring Big Easy Lofton, Ant Atkinson, Hi-Lite Bruton, Thunder Law, Bull Bullard and Cheese Chisholm - plus female stars TNT Lister, Ace Jackson and Hoops Green - the Harlem Globetrotters' show is unrivaled in the world of family entertainment. Their 2018 World Tour will showcase incredible ball handling wizardry, rim-rattling dunks, trick shots, hilarious comedy and unequaled fan interaction. After the game, Globetrotter stars will sign autographs and take photos with fans. 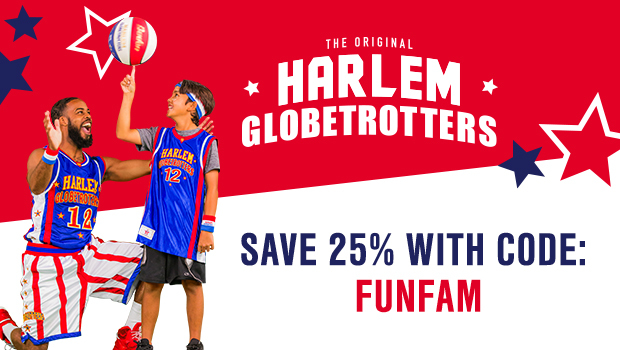 My readers will SAVE 25% for ALL Harlem Globetrotters Games with promo code FUNFAM. Offer is valid for ALL games - not just in my region.